Traditionally sand cast hexagonal aluminium lantern, making it very thick and very strong. These lanterns are left with a grainy finish to help product an authentic aged look. This style of patio pedestal is created using the bottom casting of a patio post, used to make either a small lamp or pedestal to fit on top of a pillar. Fully powder coated. 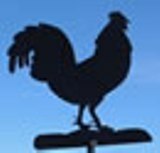 Cockerel Hanging Basket Bracket 13"
A cushioned polyurethane chair, ideal for all industrial, food and medical industries as the chair can be washed. Traditional Bentley shed available with many options. 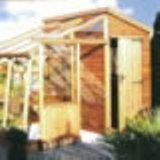 2.13x1.52m an ideal garden storage space. Plymouth log cabin measuring 4x5m (13'1 x 16'4) built using 68mm logs and ideal for use as a large garden office. Traditional potting shed 10'x6' (3.00x1.80m) in 12mm T&G cladding. The largest of the range, featuring full length potting bench and stable door.